There’s no better #MondayMotivation than a newly announced engagement. 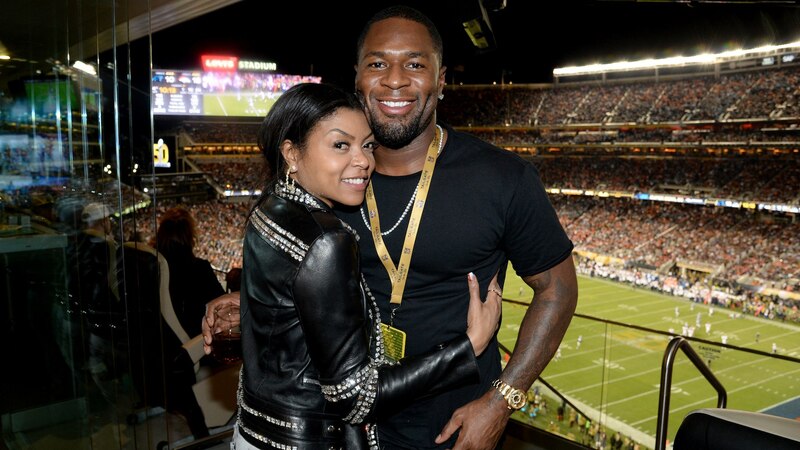 Today, Empire star Taraji P. Henson took to Instagram to share with her followers a very exciting photo: her hand in boyfriend Kelvin Hayden’s with an incredibly shiny diamond gracing her left ring finger. In her Instagram caption, Henson wrote, “I said yes y’all!!! He started with the Cartier love bracelet BUT that was my #Mothersday gift and then he dropped to his knee and I almost passed out!!! #sheisofficiallyoffthemarket and she is sooooooooooooo HAPPY!!!!!! #GODIS,” complete with crying emoji, laughing emoji, a ring emoji and some kisses for good measure. Included in the photo is a plate of chocolate-covered strawberries and a slice of cake with “Congratulations” written along the rim. Per E! News, Henson confirmed their relationship on an episode of the Essence podcast Yes, Girl! in December 2017. She said they’ve been dating since 2015 and admitted that she doesn’t like to share too many details of her personal life with the public. Around the same time, she shared a super-cute photo of her dog sitting in Hayden’s hoodie. In the caption, she referred to Hayden as the dog’s “daddy” — and called them “Big #KBall with little squirt #KBall.” The domesticity is, frankly, adorable. This will be Henson’s first marriage. She has a 24-year-old son, Marcell. His father, Henson’s high school sweetheart William Lamar Johnson, was murdered in 2003. Henson wrote about Johnson — and his alleged abuse — in her 2016 memoir, Around the Way Girl. According to New York Daily News, Henson broke things off with Johnson after he hit her hard enough to make her mouth bleed, and despite urgings from her late father to reconcile, she opted to protect herself and her son. Now, she seems incredibly happy with Hayden, who frequently posts adorable photos with Henson on Instagram. It’s great to see her smiling, especially after all that she’s been through. Here’s some more information you may want to know about the future Mr. Henson. The former cornerback played at the University of Illinois in college and was drafted by the Indianapolis Colts in the second round of the 2005 NFL draft. He also played for the Atlanta Falcons and the Chicago Bears. According to ESPN, Hayden was released from his contract with the Bears in 2014 after a 2013 injury put him on injured reserve for a full season and several other injuries on the team forced management to make roster changes. That makes him 13 years younger than Henson, who’s 47, but age ain’t nothing but a number as evidenced in their photos together — like the one above, which Hayden captioned with just a crown emoji. In addition to sharing a video of himself, his mom and his son singing along in the car on Mother’s Day, Hayden frequently posts photos of kids in his family, and it couldn’t be cuter. And speaking of being a family man, that Cartier bracelet he gifted Henson seems to suggest he supports her as a mom — and that’s important with wedding bells in their future. We’re so happy for this beautiful couple and cannot wait to hear more about their wedding details as time goes on. Congrats, you two!